Instant Pot Steamed Sweet Potatoes cook evenly and thoroughly in short order. Cooking any vegetable under pressure with an instant pot is a quick, easy and nutritious cooking method. Learn how to make Instant Pot Steamed Sweet Potato puree in this video. This process Also works for ALL squash that are seeded and chopped into 3 inch or smaller chunks. I use this process to make my Instant Pot Butternut Pumpkin Soup. Cook up a batch of Instant Pot steamed sweet potatoes ahead as puree and store it in the fridge or freezer for quick yummy recipes like Sweet sweet Potato Cinnamon cake and Sweet Potato Pumpkin Pie. What is Thanksgiving and Christmas holiday without a good Sweet Potato Casserole? Pureed Sweet Potatoes are tasty! This Naturally sweet, no fat, high fiber root vegetable adds an incredible wealth of nutrients and flavor options to your family diet. Sweet potatoes are loaded with antioxidants, beta carotenes, and much more. If you are a homemade food junkie like me the[easyazon_link identifier=”B00FLYWNYQ” locale=”US” tag=”homefoodjunk-20″]instant pot[/easyazon_link] opens new and better possibilities in the kitchen. Making puree with your instant pot is simple to do and store for later. Wanna invite sweet potatoes to your breakfast menu? Try our Chocolate Chunk Sweet Potato Granola. Kids love it and this granola will fill them with delicious nutrients not a lot of unnecessary sugar. Make your own baby food! 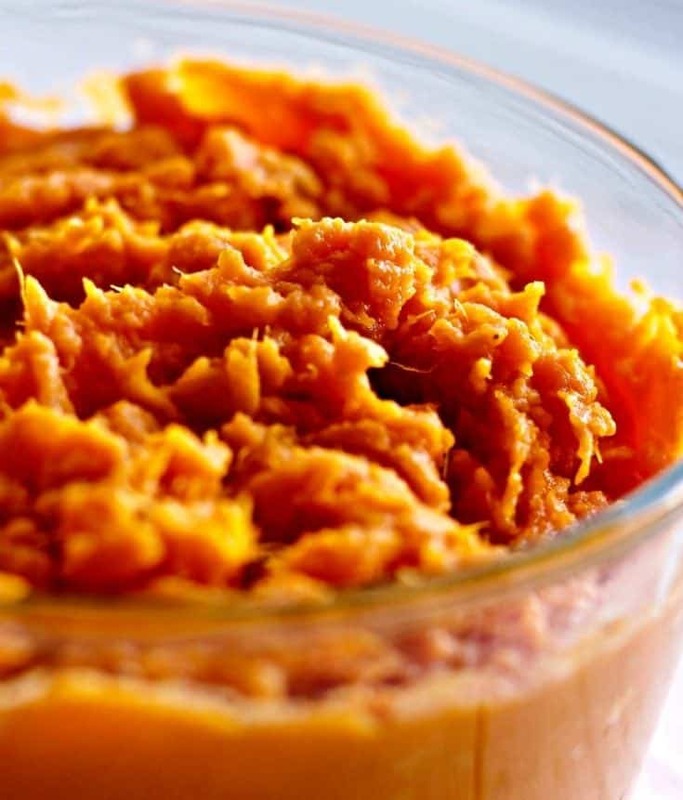 Sweet potato puree is so easy, nutritious and inexpensive to make and babies love it. If you are a healthy meal planner, sweet potato puree is handy to keep in your fridge to freezer to add to smoothies, recipes and eat for snacks. Find more information on making and freezing your own purees in My homemade Roasted Pumpkin puree post. 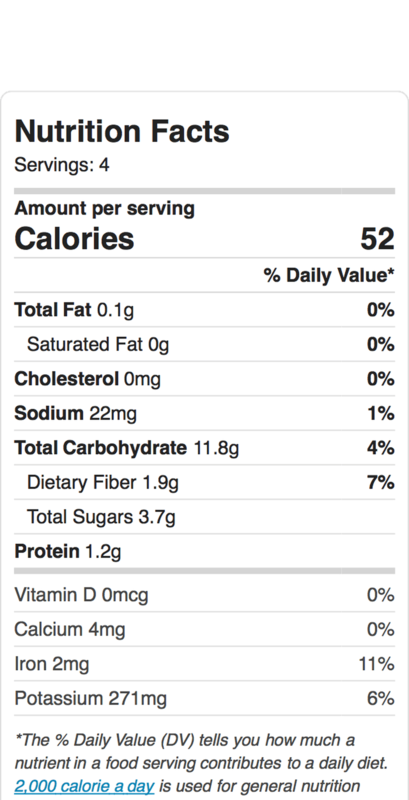 For further in depth nutritional information on sweet potatoes go to this fascinating WHFoods article. This is a vegetable you need to eat often! Back in the day, I used a metal steamer on the stove in a pot of boiling water to steam my veggies. Steaming under pressure with [easyazon_link identifier=”B01CONW4RM” locale=”US” tag=”homefoodjunk-20″] my Instant pot and Cuisinework steamer and mitt set[/easyazon_link] is my favorite steamer method now. This [easyazon_link identifier=”B06Y4H5X9G” locale=”US” tag=”homefoodjunk-20″]silicone steamer[/easyazon_link] is so easy to maneuver in and out of the instant pot. The steamer has two separate handles that can lock together at the top to form a handle and help keep the food in the steamer. The handy [easyazon_link identifier=”B01MXSCIIQ” locale=”US” tag=”homefoodjunk-20″]silicone mitts[/easyazon_link] that came with my steamer don’t let steaming hot water pass through to my fingers when I lift the steamer out of the pot. I appreciate that! Getting ready to steam sweet potatoes in chunks for sweet potato puree. Steaming vegetables of all kinds in the instant Pot is incredibly easy. You will have to make a judgement call on how big your chunks are and what the exact chunk size calls for. Allowing the instant pot to natural release for 10 minutes before opening the lids will ensure the sweet potatoes are tender. If you prefer, you can increase the time on the manual function to 9 minutes and then quick release. It’s pretty much the same time frame to get your potatoes tender. I prefer the natural release method. Why is the Instant Pot cooking more nutritiously than my stove and oven? 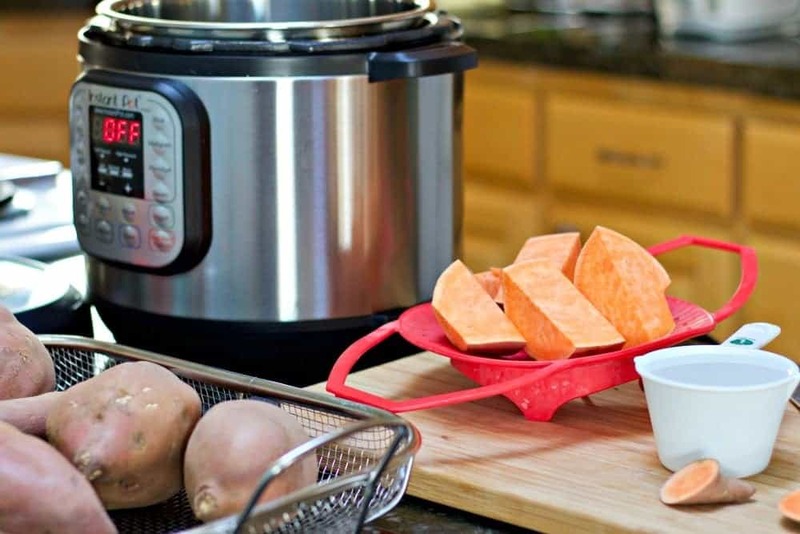 Using organic sweet potatoes and [easyazon_link identifier=”B00FLYWNYQ” locale=”US” tag=”homefoodjunk-20″]instant pot 6 quart DUO[/easyazon_link] for quick cooking actually saves more nutrients than even stovetop steaming. Cooking with the instant pot retains up to 90 to 95 % of nutrients. And most often the lost nutrients are still live in the cooking water. Read this article by Wellness MaMa for more information on how cooking under pressure saves nutrients in food. Load your steamer right into the instant pot. Need more room? Just put the sweet potatoes right onto the trivet that comes with your instant pot. It may be a bit tricky to get the chunks out intact. The instant pot heats up no more than a pot boiling on the stove or your slow cooker. Because Pressure cooking uses steam pressure instead of prolonged super high and damaging heat, nutrients survive Pressure cooking quite well. It is a very fast cooking method so food is subjected to damaging heat for a only very short time. Want to REALLY get nutritious? Use the cooking liquid left in the Instant pot bottom. The nutrients that are extracted while cooking are often live in the juices under the food. That’s why I’m using the instant pot cooking water to thin my puree in the video. It adds lost nutrients back into the puree. The instant pot is a healthier, easier and faster way to cook food. And it does NOT steam up my kitchen. Much of the nutrients and flavor go back into the food. Instant Pot Steamed Sweet Potatoes still steaming hot from the instant pot. Notice the skins are ready to slip off. Making sweet potato puree is so easy! If you need to thin the puree for your recipe or baby simply add the cooking water back into the puree as you mix it. Adjust the consistency until you are satisfied. 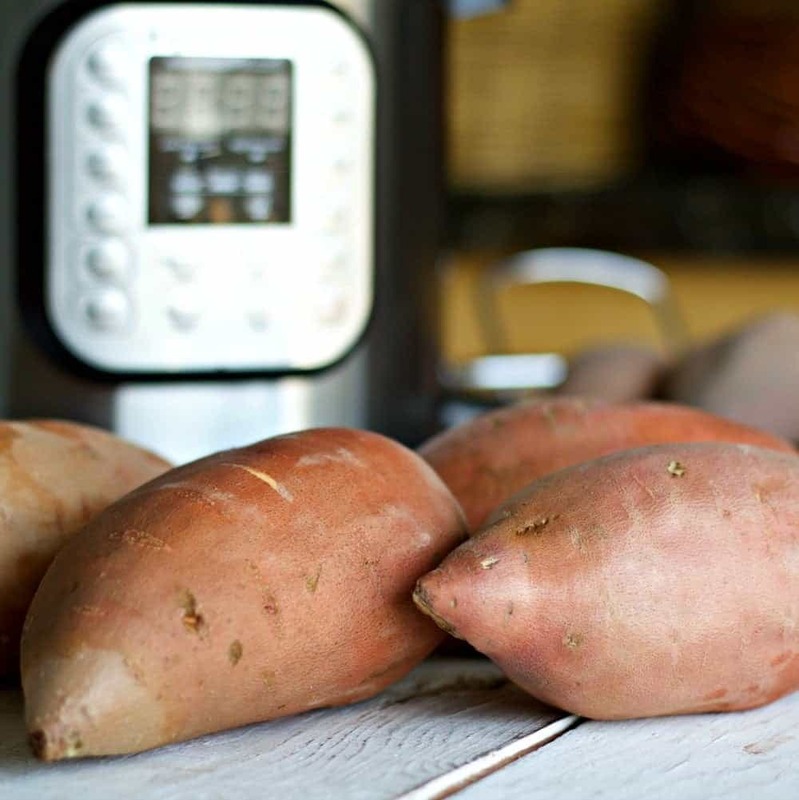 Remove the sweet potatoes from the instant pot. Slip off the skins and discard. Puree sweet potatoes when fork tender. Throw the cooked sweet potato chunks into a bowl. Using a potato masher, [easyazon_link identifier=”B001CH0ZLE” locale=”US” tag=”homefoodjunk-20″]electric mixer[/easyazon_link]or your [easyazon_link identifier=”B01AXM4WV2″ locale=”US” tag=”homefoodjunk-20″]food processor[/easyazon_link] mash them up. Sweet potatoes are dense with fiber so they will have characteristic fibers all through the mash. That is normal. If the mash is thicker than you like, add the liquid remaining in the instant pot after you steam them (for an extra nutritional boost too) until you like the consistency of your puree. The Sweet Potato puree is so good and sweet just grab a spoon and eat it up. No further sweetener required. Instant Pot Steamed sweet potato puree will last several days (up to a week) in your fridge and several months in your freezer, properly stored. Instant Pot Steamed Sweet Potatoes make a great puree. Sweet enough to eat as a snack. Delicious! An easy way to make healthy sweet potato puree. Keep some on hand stored in your fridge for recipes. This method also works well for other winter squash. Set the steamer into the instant pot cooking pot insert bottom over the water. Lock the lid onto the instant pot and seal the vent. Press the steam function key and adjust the minutes according to your sweet potato size. (I used 3 minutes and my chunks cooked perfectly. Natural release for 10 minutes then remove lid and pull out the steamer. Remove the skins from the sweet potatoes as soon as handleable. Adjust the puree consistency by adding the cooking water a little at a time as you mix until it's right. Use puree warm in recipes or store in an airtight container in your fridge for up to a week. This handy kitchen technique will also work to puree other hard shelled squash like pumpkin, acorn or butternut. Keep puree handy in your fridge for soups and other recipes or a handy side dish for the family. This puree freezes well for several months when properly stored in ziplock freezer bags. I was wondering if you can make more than 2 potatoes at a time. If so, do you increase the amount of water or change the time? Hi Katie, You can certainly use as many sweet potatoes as you can fit under the top fill line in the instant pot. If you look on the inside of the metal pot insert you will find this handy mark. The top fill line is as far as you want to fill your pot. The amount of water in the pot should not change. But I would use the flat metal trivet that came with your pot rather than the silicone one I’m using. That way you can get a lot more sweet potatoes into the pot. (To remove the sweet potatoes try dumping the pot into a large bowl otherwise they will fly all over your counter when you lift the trivet.) Also, if you are interested in really maximizing your pot space peel the sweet potatoes before cutting them and cut them into small chunks so more will fit in the pot. As for the time you will need, I would start with 3 minutes and adjust the time if you need to. If the pieces are small and you natural release for 10 minutes I think your sweet potatoes will be ready to mash. Thank you for the question! Let me know how this turns out for you. I see that using instant pot is really suitable for streaming potatoes! Your dish looks very great! Do you know how long will it last in refrigerator? Hi Lita, yes the instant pot is an excellent tool for steaming all sorts of vegetables. I have used it for many other vegetables such as carrots, broccoli and russet and red potatoes with great success. The sweet potatoes hold well for at least a week in my fridge. Thanks for the question and have a great day!